File synchronization utilities help you keep updated copies of files or folders in two or more locations, such as different computers, network drives, USB drives, or online storage. While a file sync utility could be used as a simple backup tool (called one-way syncing), its real power lies in keeping an identical set of working files in two or more locations. An example of this would be keeping current versions of the same data files on both your home computer and office computer (two-way syncing). File sync utilities keep track of which files you create or change, or even delete in one location, and can create, change and delete those same files in the other location. There are a lot of contenders in this category, but only a few stand out based on the criteria below. A good synchronization utility would have most or all the following features. Support two-way synchronization of files. Able to replicate any source folder even if the files are in use. Detect conflicts or file collisions. These occur when a file has changed in both locations since the last sync operation. This requires that a database or journal be kept by the utility. Propagate deletions and detect file renames. This also requires a log file of previous operations. Support filters and rules for fine tuning what files are, or are not included in the sync operations. Show a preview of what is going to take place during a sync operation, and allow the user to easily over-ride any actions desired. Support syncing to both local and network locations. Very robust set of filters and rules, support for FTP. Monthly file copy limit of 40,000 files, no support for copying locked files. SyncBack supports file compression and can verify file integrity after job completion. Synkron had a lot of votes for this one in the comments section. File Synchronizer is good if you are looking for a minimalistic or simplistic utility. This software review is copy-edited by Ian Richards. Please help edit and improve this article by clicking here. Currently seems to be a problem finding home website of FreeFileSync. The Help tab within the program results in unable to connect and if you follow the download link given here it takes you to SourceForge. There is a link there but that also results in "Unable to connect". I've had the program since version 8.3 but occasionally go to the website to consult the manual. There are a few blogs about the program but there not quite as good as the developers proper manual. Maybe it's a temporary issue or maybe the project has been terminated. Based on comments of others here I thought I'd give Synchredible a try. However my "go to" file download site, Softpedia, only seems to have the commercial version. A search found the developers site and they do have a "Free for private purposes" file to download. As of 2017-01-30, this project may now be found at http://www.freefilesync.org/. Have updated the product details, will show the correct site now. Thank you for your post. However, the point of this post is not to dwell on that, but rather their support situation. The company Ascorp (in Germany) has a not-very-active forum. I was going to create an account in order to ask a question or two. Unfortunately, their forum registration form wouldn't let me create an account. (1) The form included a captcha that you had to respond to, but neither Firefox nor IE would display the graphic. Only after I told IE to "display insecure content" would the graphic appear. (2) For some reason, the form said that "the community" wouldn't accept my e-mail address, and please use a different e-mail. Well, sorry, but that's my e-mail (the same one I use for my account here at techsupportalert). So I have a problem I can't solve with the app and no way to get on the forum to ask a question. That doesn't work for me. If I have a better experience with another app, I'll report it back here for the benefit of those who follow. Following up from a couple of days ago, I am very pleased with SyncBackFree, which is in the "honorable mentions" category of this review. SBF won't appeal to everyone. It has a bit of a learning curve as there are a LOT of options. I like software that puts the user in charge, and SBF certainly does that. In a nutshell, you create one or more "profiles" (i.e., tasks) for the back-up, synchronization, or mirror you want to perform. It will do pretty much any file operation you can think of, contingent on the status of the files & folders in the source & destination drives. It operates on demand or, via Windows Task Scheduler, on the schedule you set. You can set filters at the file and folder level, and you can either skip or include files or folders that are created after you set up the filter. You can set a warning so that you don't delete a bunch of your backup files inadvertently..
A particular strength of SBF is the comprehensive, context-aware help utility. On the flip side, the after-the-fact reporting could be more flexible and robust. By default, SBF provides a recap of the most recent run of each profile. I would prefer that it didn't overwrite the previous log, and instead offer to retain all logs for "x" number of runs or "y" number of days. The intrepid user can work around the issue, but native support would be better. Some options (e.g., encryption and versioning) are reserved for one of the two paid-for versions. But the free version does a lot. I recommend it for those whose back-up needs might be a little more complex than average and/or for those who like a fine level of control over their critical apps. After all, isnt that the point of a folder and file backup program ?? Also some synchronisation freeware works well enough, but are very slow. Its often not evident you are using a slow program, until you have found a faster one ! I just installed FFS and did a sync - the backup folders have todays date and time, not the timestamp of the original folders ! Another interesting find is DSynchronize, which has a portable version, so you dont have to muck up your registry. No idea why the time stamps would not carry across to your backup in FFS. Must be something with your system or settings. I can see no option to update backup file to today's date. I presume you are mirroring? My backup is identical to the nearest byte to my original, apart from files and folders that I filter out. Australia, thanks for your comments. I am managing about 3 TB of data, so I certainly do appreciate speed. In the checking I've done so far, SyncBackFree doesn't seem to be missing any files. My biggest folder has 250,000-plus files (including subfolders) and the numbers agree between my source and destination. But I will test more thoroughly, based on your cautionary words. If you are running in interactive mode, SBF does give the user a report of exactly what files & folders will be copied, created, and deleted. You can review the report and abort the run before any changes are made. In fact, there is a Simulated Run mode that does just that. I think that is a fairly common feature. Based on earlier user comments, I opted not to evaluate FFS. If SBF hadn't worked out for me, TrueSyncFree was next on my list, although I did see a comment or two that TSF had skipped files. I have been a FreeFileSync user for a long time. No more. Synchredible is great. Enough so that I bought the premium version in order to support the developer. Agreed on FreeFileSync. I'm not going to use a data sync tool that is sharing activity with external servers. Synchredible looks good but wouldn't backup to a NAS as it won't see it. I also use a Backup on Save tool. Used FileHamster for years bit its not being updated and uses old .NET. Yardis sort of works but seems to get confused. As a followup, I've been using Aomei Backupper for imaging my boot drive. Just discovered their version 4 has added Real-time Sync in the scheduling section. This will allow me to use it for Backup on Save functions as well - this is for key files to be automatically backed up with each new version. It avoids loosing a days work if something goes wrong between daily data backups. It's saved my bacon a couple of times. Synchredible is a good sync tool too though. Cleaner interface than FFS. The free version of FFS now has ads. That requires sending data to ad servers and returning with the ad content. What that data includes, I don't know but there is often an effort to "target" the ads, meaning they share some user data. I have 0 interest in having adware on my computer, especially when I have no way of knowing what is being shared with who. Many examples illustrate that once that door is opened, collected data tends to expand. There is also issues with opening a door for malware if the unknown ad companies are compromised. If you've supported FFS, perhaps he gave you a code that turns that off? I understand why developers are doing this. Its become common for free apps on cell phones and is widespread online. Most people have no clue how much of their user data is being collected and shared unknowingly. But I'd rather not invite that onto my desktop. To use an analogy, it's one thing to have someone listen in on a conversation in a restaurant. It's quite another to have it happen in my living room. I have been using FreeFileSync for quite sometime now. I haven't seen any ads yet. To confirm, I just opened FreeFileSync, but cannot see ads anywhere in the program. Are you using current version? I stayed with the old version for awhile to avoid this new "feature" but have now replaced it. Yes, I am using the latest version. Then apparently you either paid something (see comment below) or have an exceptional firewall. Neither. I am using Windows Firewall, and it's the free version of FreeFileSync, and not the donation one. Curious. That's not been my experience. In any case, I've migrated to a tool I prefer. Oh curious. I Googled for the NAS issue and someone mentioning reinstalling Synchredible and then it worked. And indeed it did. I can now sync to my NAS. FreeFileSync has been updated to version 8.10 (2017.03.11). I can also vouch for the free version of Synchredible; it truly is incredible and can handle tremendous folder trees without choking as so many of the other programs do. Many of these programs can handle a few hundred files in a very few folders, but then start making big mistakes the more you throw at them. I was also able to download and install Synchredible without getting any undesirable hitch-hikers in the process. FreeFileSync 8.7 has been released (2016.12.06); the full changelog may be found at http://www.softpedia.com/progChangelog/FreeFileSync-Changelog-111247.html . FreeFileSync suits my needs. I find it easy enough to use and it has a pretty simple and intuitive GUi. I've used it on and off for years and always keep coming back to it. I like it so much I donated $20 to the developer. Unfortunately that payment does not include upgrades. If I do upgrade to any future versions it reverts to the bundleware version, so I'm sticking with version 8.3 indefinitely. It's a pity they don't just provide a "Pro" version that includes all future upgrades. FreeFileSync is excellent - at least six stars. My MalwareBytes identified OpenCandy as a PUP, but I agreed to install anyway. In practice, no open candy, no malware. But quite why I don't know. As a precaution, I took a registry backup before installing. But this time, and the last two or three, there has been no click-off malware button during the install, and nothing untoward has installed. Actually the program is so useful, that I will go back to donating for each new version - not very much I admit, but I do donate more for major upgrades, eg, when FFS goes to version 9. I am looking forward to the day when Zenju can give OpenCandy the flick and just rely on donations. Encouraging is that it doesn't seem to have done anything, but I have anyway deleted it. I will also post to the FFS forum. I have therefore reduced my FFS rating to 5 stars. The application Unchecky is quite useful in helping to deal with PUPs (such as OpenCandy) that may be included with an application one would like to install. During the installation process, it helps steer one along the path to the options (if they have been provided) to deselect the PUPs that may have been bundled with the app. It also writes exclusions to the HOSTS file, preventing the PUPs from phoning home (http://www.softpedia.com/get/System/OS-Enhancements/Unchecky.shtml). The app automatically updates itself. Also extremely useful (in many ways) is the venerable WinPatrol, as another commenter has mentioned (http://www.softpedia.com/get/Internet/Popup-Ad-Spyware-Blockers/WinPatrol.shtml). Both are highly recommended (if not essential) for every Windows box, IMHO. FreeFileSync has now become a malware site. Unless you make a donation when downloading the program, you will get an anti-virus program installed without any notification or way to opt out, and a search bar. If not for Winpatrol, I would not have know the anti-virus and search bar where being installed. Please stop recommending this software. 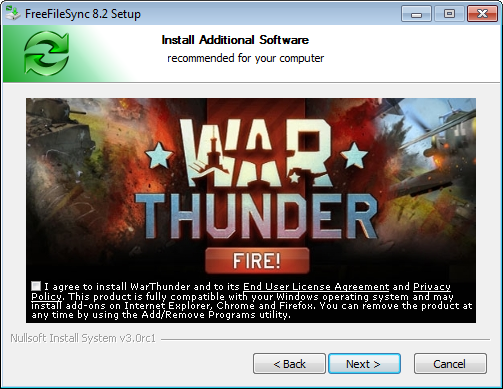 It is now common practice for freeware programs to come bundled with unwanted components. This is why we have an installer warning message next to the download link and publish articles such as this. When you run the installer it is necessary to block any outgoing connections in order to prevent these from downloading additional material although the fact this is happening is clearly stated during the install process. You can easily make a test install first using one of the freeware programs such as ToolWiz Time Freeze. MC - Site Manager. Though only garnering an Honorable Mention, SyncBack Free has been updated to version 7.6.4.0 (2016.03.16); VirusTotal reports it to be 100% clean.